Figure A2. Agattu anomaly, interpreted as the Agattu slab, with (horizontal) [vertical] cross sections through (A)[D] the UUP07 p-wave) and (B)[D] the combined SL2013 and S40RTS s-wave models at 870 km; C) the location of the modern geological record that we interpret to have formed during the subduction of the slab. Recent plate-kinematic reconstructions of the north Pacific region by Domeier et al. (2017) and Vaes et al. (2019) correlated the Agattu slab with the Late Cretaceous-Paleogene Olyutorsky intra-oceanic arc (also known as the Achaivayam-Valaginsky arc) terrane preserved on Kamchatka, consistent with the previous interpretation included in the Atlas (van der Meer et al., 2018). Both models show that the Olyutorsky arc likely formed above a southward-dipping subduction zone that initiated at or close to the Izanagi-Pacific ridge at 85-80 Ma, at the time of a regional plate reorganization in the northern Pacific (Domeier et al., 2017; Vaes et al., 2019). 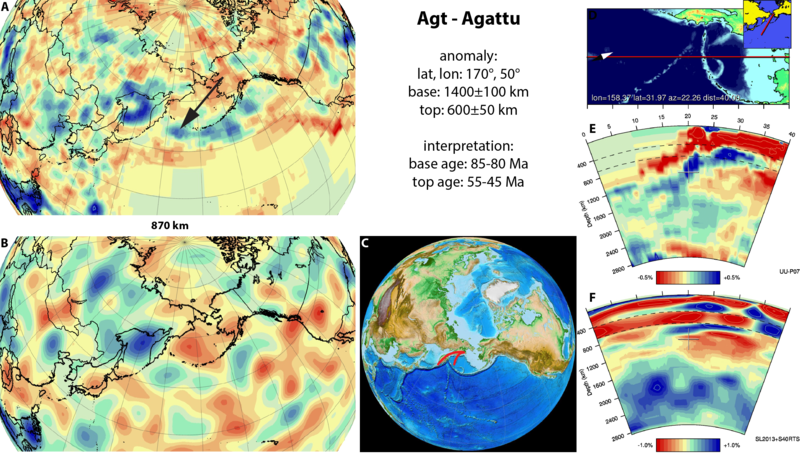 The Olyutorsky arc was suggested to have been built on either the Pacific plate (Domeier et al., 2017) or a separate oceanic ‘Olyutorsky plate’ (Vaes et al., 2019). Northward drift of the Olyutorsky arc accommodated by rapid trench retreat culminated in the collision and obduction of the Olyutorsky arc with the Kamchatka peninsula between 55-45 Ma (e.g., Shapiro and Solov’ev, 2009; Domeier et al., 2017; Vaes et al., 2019). Vaes et al. (2019) showed that the southwestern part of the arc (named the East Sakhalin-Nemuro arc) continued to move towards the northwest, guided by a NW-SE-oriented strike-slip fault in the Okhotsk Sea region, resulting in the collision of arc remnants with the Asian margin at ~45-40 Ma. The associated slab segment may be preserved as a part of the interpreted Sakhalin slab or as the lower part of the horizontal segment of the Kamchatka-Kuriles slab (Vaes et al., 2019). The Agattu anomaly (Figure A2) is a detached slab located below the northernmost Pacific Ocean, in the upper part of the upper mantle and uppermost part of the lower mantle, predominantly south and west of the Aleutian trench. At its deepest it is W-E striking and south dipping, changing to a NW-SE orientation in the uppermost lower mantle. At its shallowest it is located south of the Aleutian slab. Van der Meer et al. (2010) interpreted it as a slab representing the westernmost part of the North Pacific slab. The tectonic model of Shapiro and Solov’ev (2009) now allow us to refine this interpretation, and define the Agattu slab separately. The Agattu slab is detached and its top is located at a similar depth as the base of the actively subducting Aleutian slab, which started to subduct around 56-46 Ma. We hence searched for geological records in the NW Pacific realm of subduction that ceased in Eocene time. At a latitude consistent with this intra-oceanic location, Shapiro and Solov’ev (2009) used paleomagnetic data to reconstruct the Achaivayam–Valaginsky terrane. This terrane comprises Upper Cretaceous and Lower Paleocene volcanic and sedimentary rocks of diverse but mostly submarine facies, with older Mesozoic volcano-sedimentary blocks and ophiolite fragments. The arc originated at about 90–85 Ma (Coniacian–Santonian) as an island arc built upon oceanic crust (Bogdanov et al., 1987; Sokolov, 1992, as cited in Shapiro and Solov’ev (2009), subducting to the southeast and culminating in ophiolite emplacement onto Kamchatka, Sakhalin, and Hokkaido around 50-45 Ma (e.g., Nokleberg et al., 2000). This southeastward subduction zone is not portrayed in most Pacific plate models (e.g., Seton et al., 2015; Müller et al., 2016; Torsvik et al., 2017) who do not discuss and incorporate the geological record of the northwest Pacific region. Paleomagnetic data from the Cretaceous-Paleocene ophiolites and arc rocks of Kamchatka indicate an about 2000 km northward transport of the arc terrane from its initial paleolatitude to its modern position at the Eurasian margin between the Campanian (~75 Ma) and the Middle Eocene (50–45 Ma) (Levashova, 1999; Kovalenko, 2003, as cited in Shapiro and Solov’ev (2009) suggesting north(west)ward roll-back of the slab upon Pacific plate advance. The slab geometry suggests that it was partly formed during NW ward transport towards the Eurasian margin. We therefore interpret the top of the slab to have subducted sometime between 50-45 Ma shortly following ophiolite and arc obduction onto the continental margin.